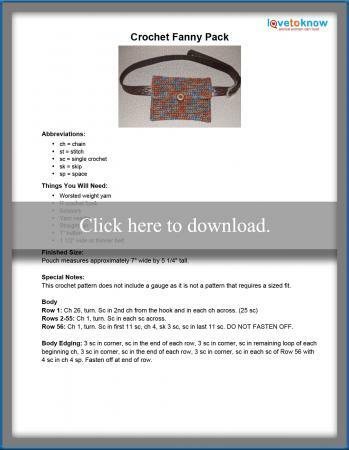 Crochet a simple fanny pack purse to carry all your small essentials for hands-free convenience. It's ideal for shopping, festivals, or attending sporting events. This is an easy pattern, suitable for a crochet beginner. The back of this pouch features a casing for attaching to a belt. Click on the pattern image below to download and print the crochet instructions. You can find additional help in printing the instructions with this Guide for Adobe Printables. The shape of this fanny pack allows for alterations and embellishments to create a custom look. The following are a few suggestions for making your bag unique. Adjusting the pouch size to fit your needs is an easy process. Simply make your beginning chain longer or shorter to make the pouch wider or narrower and add or subtract rows to adjust the length. Note: When changing the pouch width, the beginning chain of the casing should be five chains less than the pouch. Changing the crochet hook size and thickness of yarn can also change the size of the pouch. Keep in mind larger hooks and thicker yarns will make stitches larger. Larger stitches may allow coins or pens to fall through. For a bit of festive flair, attach a fun yarn fringe to the bottom edge of your pouch. Sew or glue beads, sequins, or buttons to the front of the fanny pack for a feminine touch. Make several pouches in a variety of colors to match outfits in your closet. Crochet fanny packs for everyone on your Christmas list or make a stash for last-minute birthday gifts. Yarn colors and sizes can be tweaked to fit any recipient's preferences.